This is the continuing story of how the Montmartre section of Paris was transformed into a booming Harlem-style Jazz district between the World Wars. 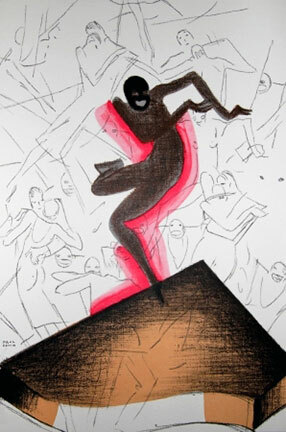 Jazz arrived in Paris with the wild success of Josephine Baker in the mid-1920s. She triggered “Le Tumulte Noir,” an insatiable demand for black American music, culture and personalities, drawing in her wake African-American musicians, singers, entertainers and black expatriates to Harlem-on-the-Seine. 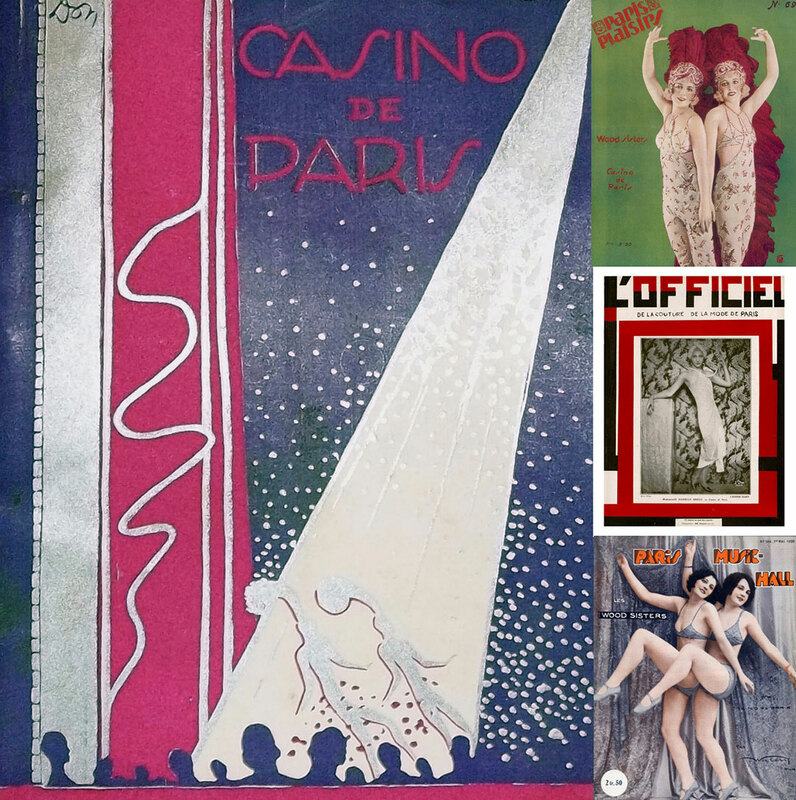 Josephine Baker’s nightclub, Bricktop’s cabaret, Zellis Royal Box, Chez Florence and the Jazz bars of Paris became all the rage among an international set of the chic and elite. Yet rarely have the women who launched and sustained this community received full credit for their vanguard role in this distant outpost of the Harlem Renaissance. Musicians on the bandstand at Zellis, L to R: pianist Glover Compton, Ferdie Allen (banjo), Cricket Smith (trumpet), Frank Goudie (alto sax) and Gene Bullard (drums). “People felt they had to come to Zelli’s. 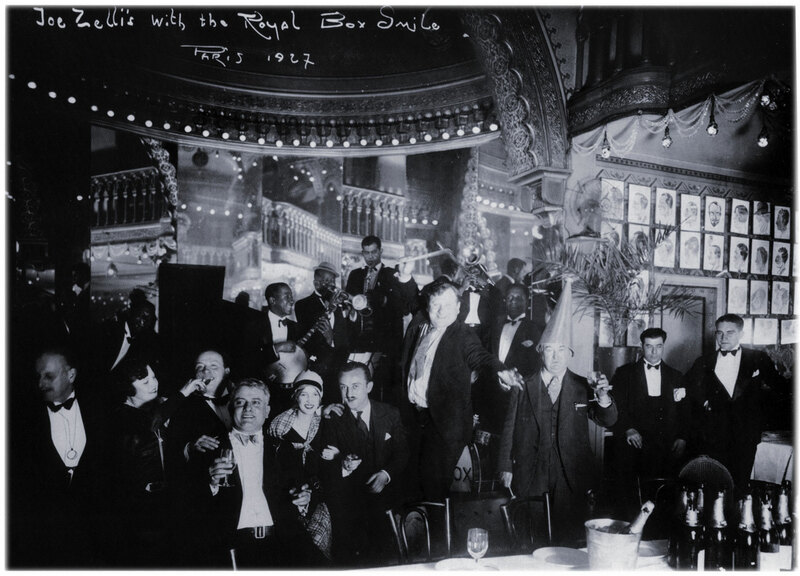 During the late-1920s Zellis Royal Box was the wildest booziest club in the Montmartre district of Paris. Gene Bullard hired the musicians, ran the band and played drums (badly, by his own admission). 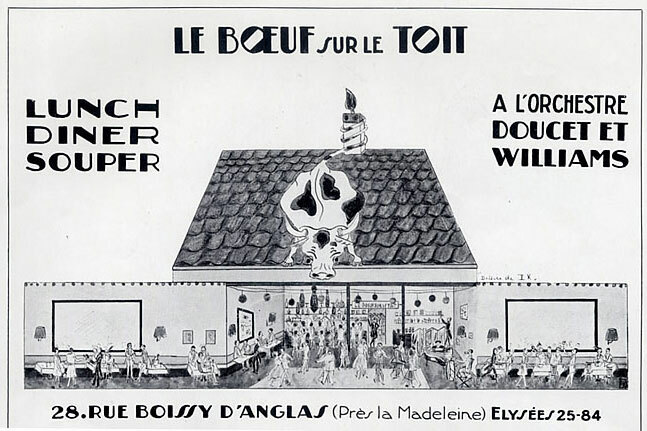 Bullard operated several American-style bars and had managed Le Grand Duc. Likewise, owner and impresario Joe Zelli ran several cabarets, including The Tempo Club after housrs upstairs for musicians. Reed player Sidney Bechet briefly played clarinet at Zellis. The club featured piano player Glover Compton, a formidable fellow who cut a wide swath. In a storied career, Compton had been a professional cakewalk dancer, and a ragtime and stride piano player in the Willie-the-Lion Smith mold. Compton was wounded in a celebrated shooting in the streets of Montmartre. The antagonist, Sidney Bechet, was imprisoned for months before his expulsion from France. Bullard Air Ace and Boxer – Athletic Club. Eugene Bullard was a World War I air ace and former boxing champion. Eugene (Gene) Jacques Bullard (1895-1961) was an African-American First World War air combat pilot who’d fought for France. He was a big personality and fulcrum of the black community in Paris, functioning as an informal yet powerful counselor and enforcer at large. Bullard successfully parlayed his status as a former boxing champion into a popular gymnasium. 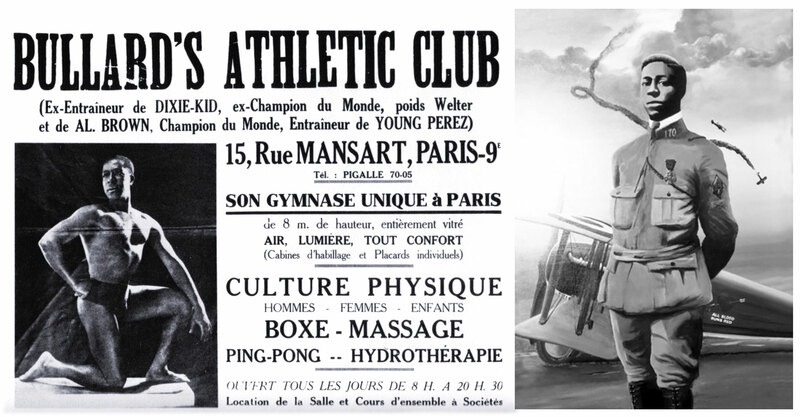 Bullard’s Athletic Club catered to both elite French Parisians and African Americans. Gyms were a popular antidote to the partying of Paris, an attempt to counteract the champagne-soaked nights with exercise, massage, hydrotherapy or coaching in boxing. And Bullard specialized in training championship pugilists. Casino de Paris, 1928. Casino de Paris was one of the earliest nightclubs presenting African American jazz bands in Paris. A good source on early jazz in France that’s based largely on interviews is Jazz Away from Home by Chris Goddard (1979). He notes that in the early 1920s Paris was quick to adopt African-American music, though French understanding of jazz developed slowly. And in truth it was still just emerging in America. 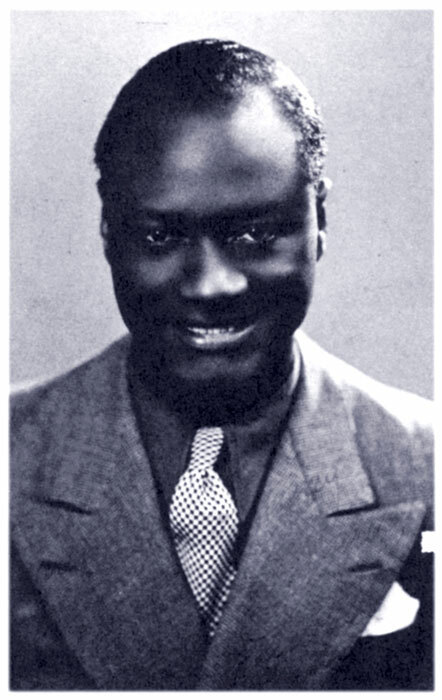 For most of the 1920s “Jazz” in France was almost any music played by African-American musicians no matter how crudely, as long as there was a drum kit and some horns. Most so-called jazz in Paris prior to around 1927 was a mélange of ragtime, brass band music and corny effects on horns, driven by excitable drummers making as much noise as possible. French cabaret and nightclub owners often hired black Americans who were not musicians but dancers to run “jazz orchestras” or drummers without training. With few exceptions, the French were unable to swing or improvise until the mid-1930s when Django Reinhardt and the Federation of Hot Clubs became the nucleus around which a native jazz movement coalesced. Colin Piano Dance. The graphics of Parisian poster artist and Josephine Baker intimate, Paul Colin. Florence Embry Jones (1892-1932) and her slightly older husband, Palmer Jones lived in Paris. Piano player Palmer Jones (1888-1928) had been performing successfully for quite a while in Europe on his own, with Louis Mitchell at Casino de Paris, and accompanying his pretty wife Florence. The couple opened numerous Montmartre nightclubs that became legend. Their best-known venue actually belonged to drummer and bandleader Louis Mitchell. Rebranded Chez Florence it was far more successful under the couple’s management. It featured the top African American entertainers living in or visiting France: multi-instrumentalist Benny Carter, singer Alberta Hunter, tap dancer Bill “Bojangles” Robinson or the orchestras of Freddy Johnson, Leon Abbey, Bobby Martin, Eddie South, Willie Lewis and others. Willie Lewis and his Entertainers performed regularly at Chez Florence 1935-38. Lewis was a handsome master of ceremonies, fair singer and skilled bandleader. He ran the best Jazz orchestra in Europe during the late 1930s. It was a solid swing band that recorded more than fifty sides in Paris and Zurich. The line-up was four reeds, three brasses, a good piano player and full rhythm section, driven by the fine bassist Wilson Meyers who co-arranged most of their 1937 session. The orchestra featured the top African-American jazz instrumentalists living in or visiting Paris: Benny Carter (briefly during 1935, mostly playing trumpet and arranging), Bill Colman (trumpet), the elegant pianist Herman Chittison and the impressive, New Orleans-born, 6’ 5” expatriate tenor saxophone and clarinet player, Frank “Big Boy” Goudie.